Saratoga was admitted to the Century as a stand alone game and has since had a number of "sister" games published. The designer and GM, Mark Miklos, wants to treat them all as equal parts of a Battles of the America Revolution event requiring players to play them all to win the event. Not everyone is familiar or comfortable with all the games in the series though. In such situations, a "default" game is chosen that can be substituted as the game of choice in any round. John Miklos (left) does battle with Dale Long in the Final of Saratoga. Dale's preference for Saratoga as the default version in each round was seen as a matter of some controversy by some. Others sympathize with Dale's position -- that a player should not be forced to play a version of the game with which he is not well versed. The issue has relevance for a number of WBC events where different versions of a game or similar game systems exist and cannot be resolved to everyone's satisfaction. Saratoga or Battles of the American Revolution? A new attendance record was set this year in the Battles of the American Revolution tournament. The event, formerly know as "Saratoga," had never drawn more than 28 players. That record was convincingly broken as 34 protagonists met to contest for King or Congress. A "Century" event since 1999, this year's tournament was relegated to "Trial" status as a result of low turnout (20 players) in 2006. In an effort to regain Century status, this year's 34 players logged a total of 70 player-starts and 172 hours of playing time. A Mulligan Round was offered for the first time this year and 16 players took advantage of that flexibility. The scenario was "Knyphausen's Feint" from the game Brandywine. American players won two contests including the tournament's only decisive victory by John Miklos. British players won four matches including substantial victories by Mark Miklos and Jeff Lange Sr. In the remaining two games players opted for the default game, Saratoga, and both of those contests were marginal American victories. 24 players entered Round 1, including five of the eight who had been defeated in the Mulligan Round. All five either won or fought to a draw in their second try, earning the right to advance to Round 2. Nathan Trent, a winner from the Mulligan Round, returned to play in Round 1 but was eliminated by Derek Miller. The game in Round 1 was Saratoga. There were six British victories and five American, including substantial victories by Chuck Stapp and Jim Tracy. Teddy Lange and Bill Alderman fought to a draw. 21 players were eligible to advance to Round 2. Of those, 16 chose to play on while five opted out. The scenario was "Washington's Stand" from the game Monmouth, the newest game in the BoAR series. The British won three including a marginal victory by Rob McCracken on the last turn over perennial BoAR powerhouse Bruno Sinigaglio. The Americans also won three, including a substantial victory by Jim Tracy. Saratoga was used in the other two contests where an American marginal victory by Andy Maly and a draw between Dale Long's British and Mark Miklos' Americans occurred. Nine players advanced to Round-3. This number of contestants was perfect since the game chosen for the round was Savannah, to be played 3-handed. When Derek Miller dropped out, however, it left eight players. Dale Long again chose the default game. That left two tables of three players each to contend for victory at Savannah while he and his opponent, Jeff Lange Sr., played Saratoga. Dale's third Saratoga victory earned him the right to be one of the four semi-finalists. The other three were going to be determined by the two winners from the Savannah games plus the defeated Savannah player with the highest VP total. 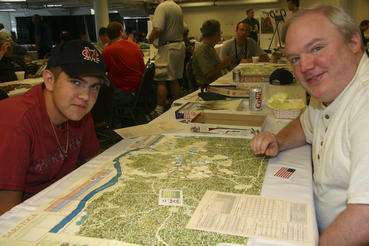 At one table, Jim Tracy's British defeated Andy Maly's French and Tommy Miklos' Americans. At the other table, John Miklos' Americans defeated Rob McCracken's British and Mark Miklos' French to earn the right to advance. Andy Maly ended up as the defeated player with the best VP total and thus became the fourth semi-finalist. Three-handed Savannah presents interesting challenges for the Allies. Even though they must share resources and work together to defeat the British, they know that only one of them can actually "win" the game. Of course, if they fail to defeat the British player it's moot. This "game within a game" is especially challenging in a tournament format where more is at stake than winning the game at hand. The consensus among many players in this year's BoAR event is that Savannah would make an interesting Final event in future tournaments. Three players could advance to the Final and the inherent jealousies between the French and the American players will certainly cause Napoleon's words to ring truethat allies are their own worse enemies. In the semi-finals, top seeded John Miklos met Andy Maly in the historical scenario from the game Guilford while second seed Dale Long met Jim Tracy. Dale again opted for the default scenario Saratoga. Dale won his fourth of five Saratoga games and advanced to the Final. Meanwhile, John Miklos' Americans destroyed Andy Maly's British in a record setting 25-minute game. With his British army wavering, Andy surrendered with 0 VPs and Army Morale of 5 while John had six VPs and a maximum Army Morale of 15. The stage was set for a Final between Dale Long and John Miklos. The scenario was to have been "Eutaw Springs" from the game Guilford, arguably the most balanced of all the games and scenarios in the BoAR system. Again, however, Dale opted for the default game and so Saratoga was set up. Very few players to this point had resorted to bidding to determine sides. Since both Dale and John preferred the British, however, they secretly bid Army Morale points. The first bid was a tie with each bidding zero. In the second bid, John won the British with a bid of 1 and he adjusted the at-start British Army Morale down by one point accordingly. The early game was one of maneuver, limited initially by moderate fog. In the middle turns, the British successfully took Freeman's Farm and also caused a casualty to an American unit for a narrow lead. In the end, the British fate was sealed when a marksman killed Burgoyne and British units were unable to win in a few key combats. Dale Long's fifth Saratoga victory out of six games played earned him the 2007 BoAR championship. Of the 34 games played, 15 were American wins, 17 were British wins, and two games were a draw. From a play balance standpoint one cannot get much better than that. In all, six different scenarios were scheduled while five scenarios were actually played. On eight occasions, (23%), the default game Saratoga was played in place of the stipulated scenario. Five of those eight "defaults" were at the request of Dale Long who went on to win the tournament. One of the remaining three default games occurred because there was a shortage of copies of Monmouth for Round 2. 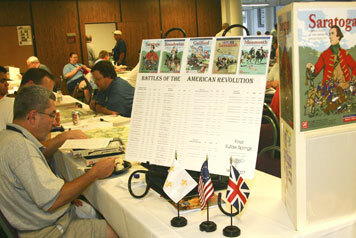 Most players eagerly acceded to the structure and spirit of the event as it attempted to challenge players with the battles of the American Revolution in chronological order. The 2004 Saratoga PBeM Tournament ended in September 2007 with a Final game of Saratoga that pitted Jim Tracy against Terry Coleman. The British and Americans did not have their hearts in the battle and both sides played with a reluctance to carry the day. However, toward mid-day the Americans rallied with confidence and resolve to attack the British and followed it up immediately pushing their new found confidence. The British were taken aback and became demoralized as they ran from the battlefield. The Americans with Greene in command had seized the day. 22 players had started back in 2004. Round 1 was a game of Guilford Courthouse. Round 2 was Eutaw Springs. Round 3 was Brandywine. In all, 22 games were played by email using Cyberboard. Also scoring laurels were Jeff Lange, Mauro Faina, Rob McCracken and Rod Coffey in third through sixth respectively.